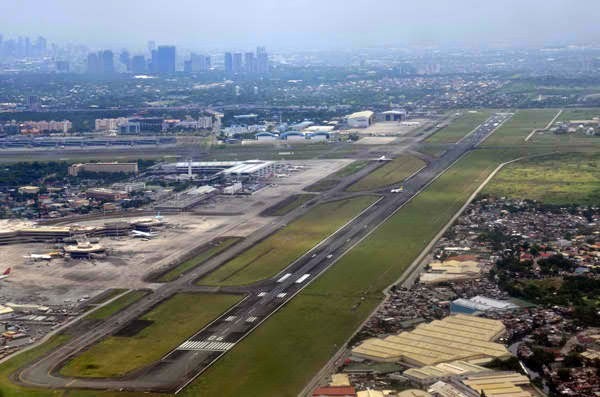 Aviation Updates Philippines - The Philippine Government is initially spending ₱2 billion for the construction of a new alternative runway to ease congestion at the Ninoy Aquino International Airport. The sidelines of the World Economic Forum (WEF) is the construction of the new runway to ease congestion at the Ninoy Aquino International Airport. "The first phase is P2 billion but we have to verify that. The new runway could allow Airbus A320 to land,” Transportation Secretary Joseph Emilio Abaya told ABS-CBN. The plan shall be studied by the Philippine Government as the proposed runway is near 600 houses beside NAIA complex. Abaya said that they are still verifying if the owners of the 600 houses near NAIA are informal settlers or private owners. Once the new runway will be operational, the simultaneous landings and take-offs of planes would disappoint homeowners as it will create loud noises. NAIA operates several midnight flights. Another concern is the possibility that the International Civil Aviation Organization (ICAO) could withdraw the certification of the existing runway once a new runway is constructed beside it. “We’re also checking with ICAO. They are saying that when you have a precision landing certified runway and if you construct a new runway beside it the existing certification will be cancelled. We don’t want this to happen,” Abaya said. Joseph Abaya said Philippine Airlines and San Miguel Corporation argued because the Los Angeles International Airport in South California has a similar set of parallel runways if the proposed runway beside Runway 06-24. The construction was believed to start next month. The Ninoy Aquino International Airport was originally built in 1981 to replace the second terminal which replaced the original terminal which caused fire in 1972. Passenger movements in 2013 went up to 32,865,000 from 31,878,935 in 2012.